This guide explains step by step what you have to do when you want to resize your thumbnails. In the example the small thumbnail is going to be resized from 50x50px to 75x75px and the medium thumbnail from 100x100px to 150x150px. Set the new sizes in the global settings = Components » Phocagallery » Control Panel (Gallery v1.8.8) » [parameters] button. Create new shadows for the small and medium images. In this case we have to create new shadow images. Look in your icon settings (global settings) whether you need to create .gif or .png files. The shadow is a white square with a border and a shadow (for the default template). The size of the white square is: image height + 6px x image width + 6px. 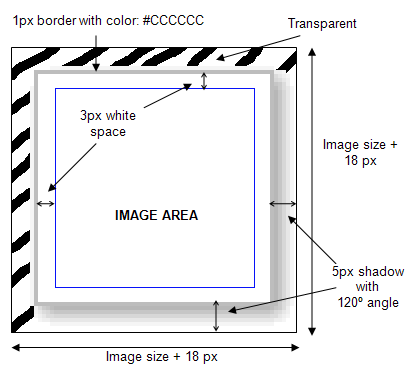 The surrounding border is 1 px with the html color: #CCCCCC. The shadow is 5 px with an 120 degrees angle. The total shadowfile for the small image is sized 93x93px and for the medium image 168x168px. Name the shadow 'shadow3.gif or .png' for the small thumbs and 'shadow2' for the medium thumbs. Set the right shadow in the global settings. Set 'Enable Thumbnails Creation' to yes. Then save the parameters and go to the Images tab. (Gallery in v1.8.8). The new thumbnails are already created when the setting was on, or it is now and if not: refresh the gallery page. Go to Menu » Main Menu (e.g.) » Phoca Gallery Categories (e.g.) » Parameters-Component. Set the new sizes of the thumbnails in each Phoca Gallery menu item.